People looking for an app to work with photos and videos may want to take a look at the new PhotoSync update for iOS. 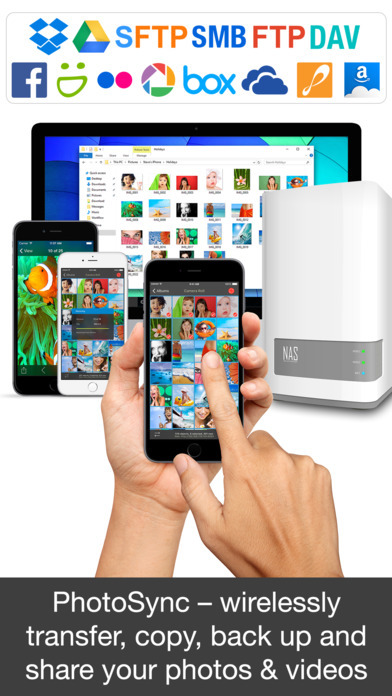 Some say this is the most versatile and powerful app to transfer, backup and share photos and videos over the air. PhotoSync 3.2 for iOS includes support for the SMB Protocol, Share Sheet Integration and automatic sub-directory creation for user albums. The update also introduces transfer from / to "OneDrive for Business" and over 50 further improvements. Introduced in February 2011 and used by over a million photographers, PhotoSync is a long time favorite amongst iPhone / iPad users to backup and transfer their photos & videos to computer, other mobile devices (iOS and Android), NAS, and cloud and photo services. Today's update adds even more power and flexibility to an already versatile product. PhotoSync adds support for the SMB protocol and enables transfer from / to NAS devices and Time Capsule. PhotoSync is now also available from the "Share Menu" of other apps and supports direct transfer from e.g., the Photos App, Pixelmator, Photoshop Express and even Safari. The new "Automatic sub-directory creation for albums" is an absolute time saver. It can recreate the user albums of the iPhone / iPad on the target device without any user interaction. PhotoSync for iOS also ships with a French, German, Spanish, Japanese, Korean, Traditional Chinese and Simplified Chinese localization. Accompanying the release of PhotoSync 3.2 for iOS, touchbyte has also developed new versions of the FREE PhotoSync Companion for Mac & Windows PC available for download on the website. PhotoSync for iOS 3.2 is $2.99 USD (or equivalent amount in other currencies) and available worldwide through the App Store in the Photo & Video category. There is also an Android version available on Google Play. Hamburg, Germany - touchbyte GmbH was founded 2010 in Hamburg, Germany and specializes in software development for mobile devices. Copyright (C) 2017 touchbyte GmbH All Rights Reserved. Apple, the Apple logo, iPhone, iPad, iPad mini, iPod touch, and Mac are registered trademarks of Apple Inc. in the U.S. and / or other countries. Android is a registered trademark of Google Inc. Other trademarks and registered trademarks may be the property of their respective owners. Lots of photos? Get them Synced.